6x14" Linen Drawstring Bags are made of a linen blend with cord drawstrings. Space above drawstring is approx. 2”. Great for wine, olive oil and vinegar bottles! Linen favor bags are great for weddings and parties and many other occasions. These bags have a textured look and feel. We offer these bags in several sizes at wholesale prices. The material of the bags is made of 50% linen, 40% polyester and 10% cotton. Small cloth bags are perfect for jewelry, bath salts and gift cards. We have the popular 3x4", 4x6" and 5x7"! Medium sized pouches are great for slightly larger items like candles, lotions and perfumes, or even make up! The round bottom bags make standing displays easy. 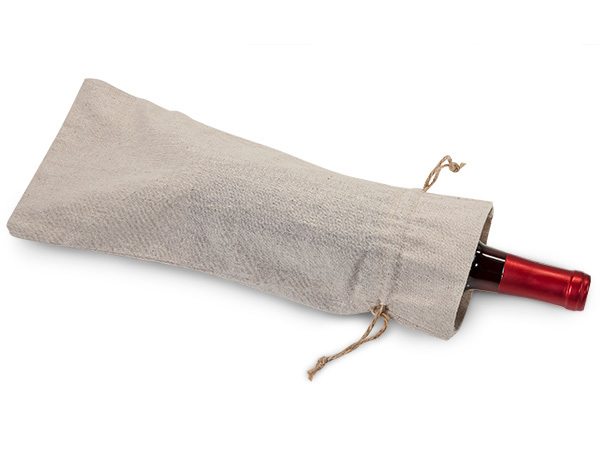 Our large size bags are great for wine bottles, clothing items and books. They make easy hostess gift packaging. The large 10x12" bag can hold items like custom T-shirts, leggings, or even shoes! These linen bags are easy to stamp with a rubber stamp and ink pad. You can add your logo, or create a fun stamp just for your special occasion. Stamp These Bags for a Custom Look!